How do you like my Gingerbread Men? I decided to make it yesterday and did not get out of my sewing room until it was finished - I get in that mood sometimes! I used scraps of navy blue fabric with different whites for the background. The shapes were fused in place and appliqued with my method of choice - machine stitched with blanket stitch and dark blue 40 wt thread. 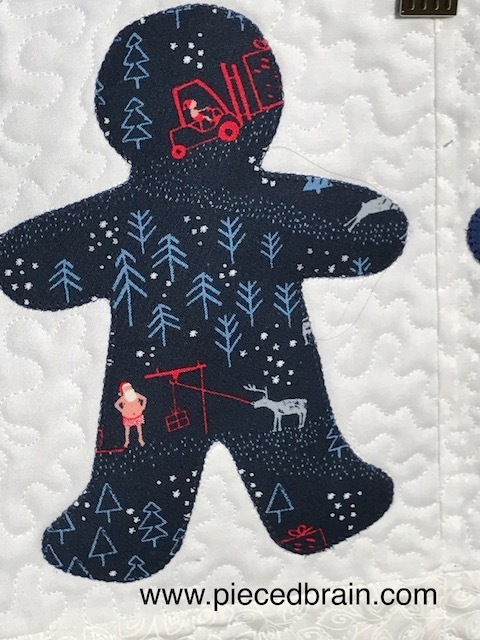 The quilting was done with Aurifil monofilament around the Gingerbread Men and on the ditch, then with 40 wt white all over. 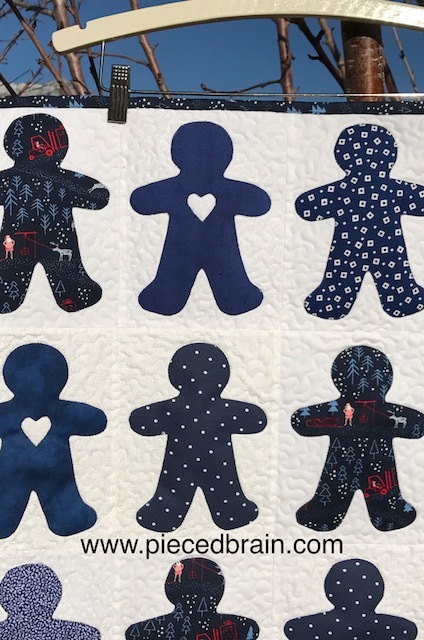 I found the Gingerbread Men pattern in Edyta Sitar's latest book "Patches of Blue: 17 Quilt Patterns & a Gallery of Inspiring Antique Quilts", published by Martingale. 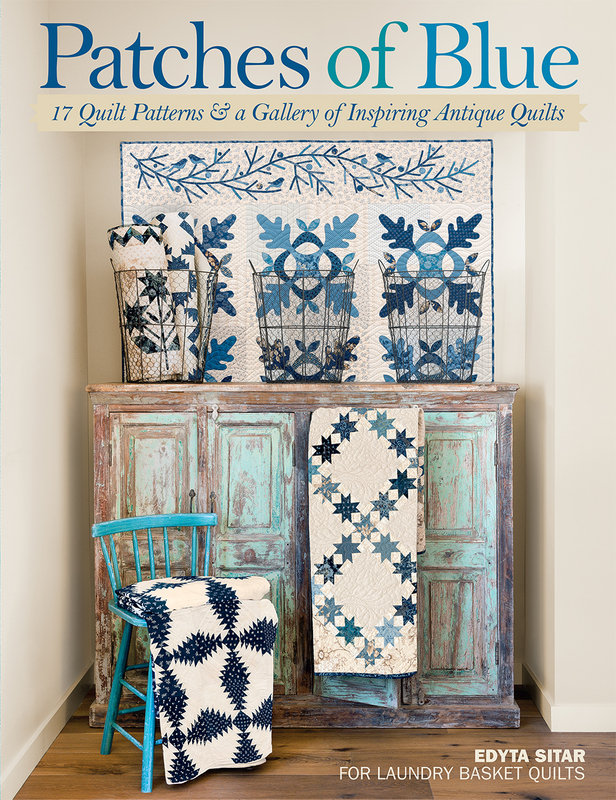 The book opens with the antique white (beige) and blue quilts which no doubt inspired Edyta's patterns. This presentation order gave me the impression I was inside her brain connecting the dots between the old and what might be, bridging the generational gap and focusing on the colors, the blocks, the fabrics at her fingertips. Whatever her process, it resulted in 17 fantastic patterns. Blue Bells above wins my prize as my favorite quilt in the book.The block repetition is so soothing to me: I still prefer a quilt to be a sampler of fabrics as opposed to a block sampler. Unlike my wall hanging where the blues are bright, Edyta's blues are subtle making them a perfect accompaniment for the beiges she uses as background. 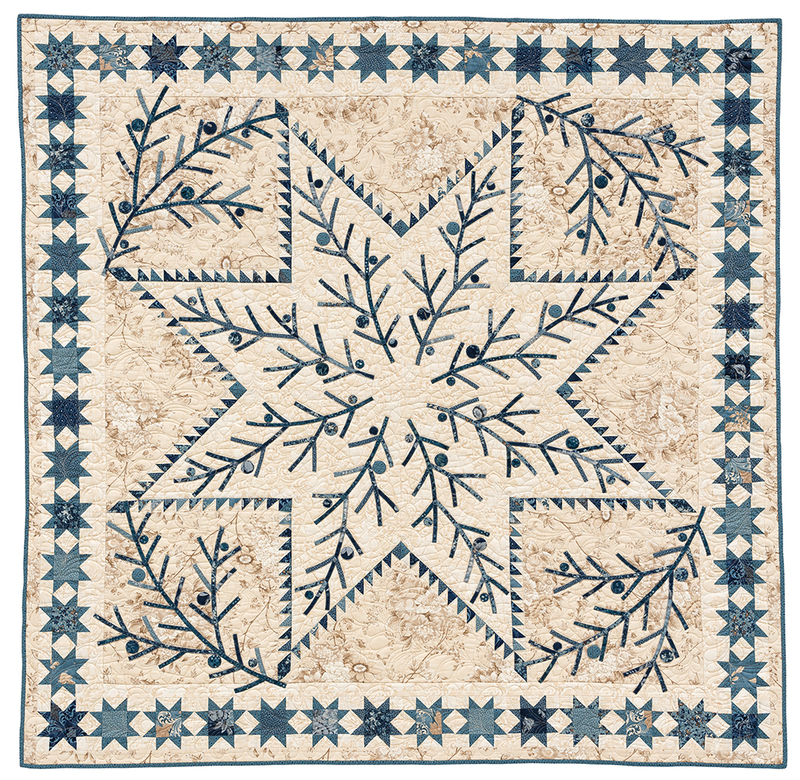 The applique' branches on Shining Star above soften the sharp edges of the sawtooth star without stealing its spark. I liked that "Patches of Blue" has smaller projects also. These table runners are beautiful and so fast to make, perhaps even faster than the project I chose. I did have my grandsons in mind when I chose it, though, especially since I used some fabrics from a quilt my son is using over his couch at his house. There, now you know my plan! It had been a long time since I made a white and blue quilt as my brain and hands have been so occupied with fabrics of every other shade on the planet. 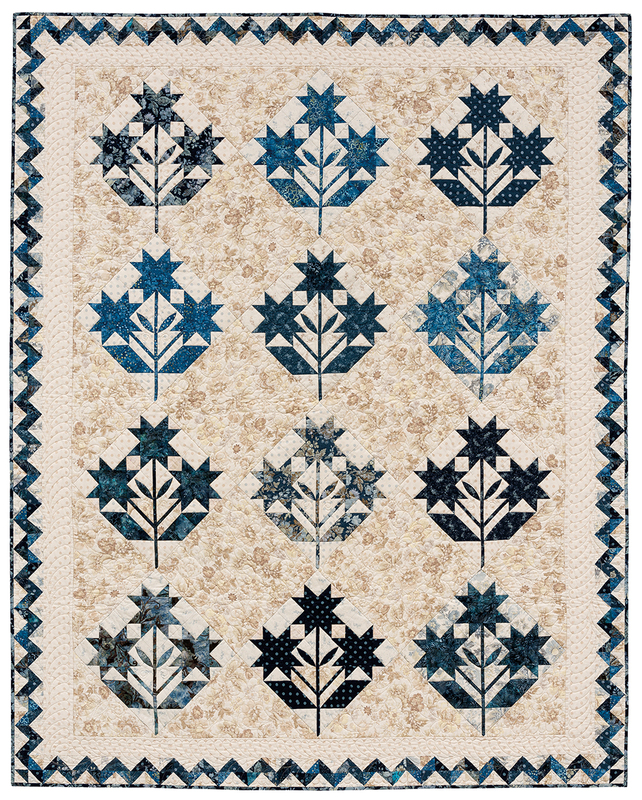 Of course, any of the patterns in Edyta's book would look wonderful as scrap quilts or with red or your color of choice in place of the blues. However, "Patches of Blue" is a celebration of gorgeous blues so if you haven't made white/beige and blue quilts yet, this is the best place to start! FAbulous!!! And that Santa! Yes, Love it! Makes me giggle! OMGosh...that is so cute. All of the blue quilts in there are so pretty. Olá!Adorei! !Papai Noel brasileiro....rsrsrs perdeu até a roupa visitando aqui...kkkkkkBeijoGrannnde!! 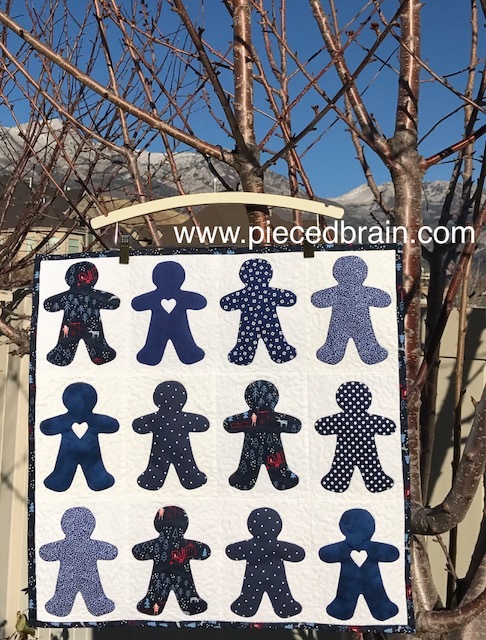 Your gingerbread man quilt is so cute! 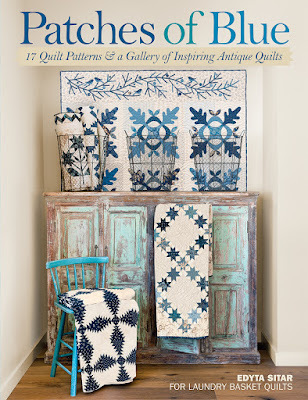 I like every single quilt I have seen in that book and her fabrics are just so gorgeous! I rarely sew with blues, but now I feel the need to run make something blue. LOL Love those gingerbread guys and that Santa is too funny! Really cute Denise. 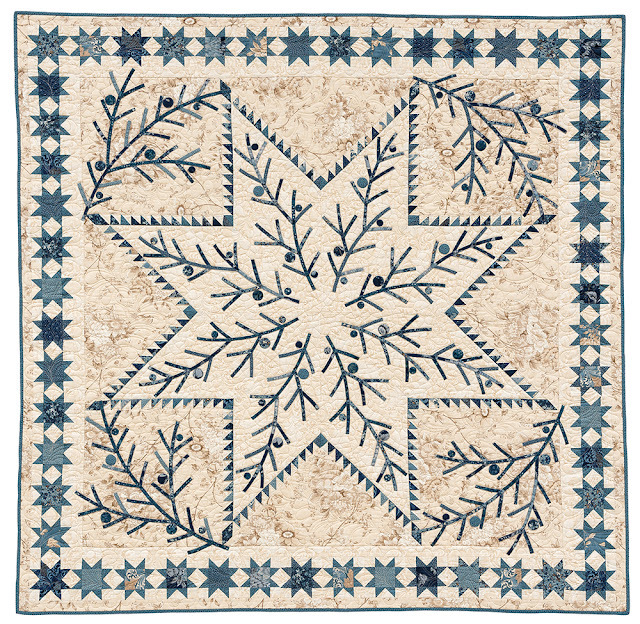 Blue holiday quilts are festive and you can use them through the winter. I love gingerbread men, the blue and white with little pops of red is lovely. Your quilt makes me smile it's so happy. OMG!! That is SEW cute!! Love how you sort of made a matching game of your fabric choice, too. Super cute gingerbread men. :) Haha! (Laughing at the funny Santa) This book looks very appealing, too - one for my list.